Where can I find the bank and what is the purpose of the bank? How do I purchase Farmcash or coins? I have never purchased FarmCash, but I have it on my account. Why? Do I have to buy FarmCash? What is the difference between coins and FarmCash? I bought an item in FC but when I sell the item I get coins, not FC. Is this normal? How to get a refund if a problem arises? How do i check my Farm Cash purchases in the game? Last edited by Tiger Laybourne; Oct 25 2018 at 12:36 PM. 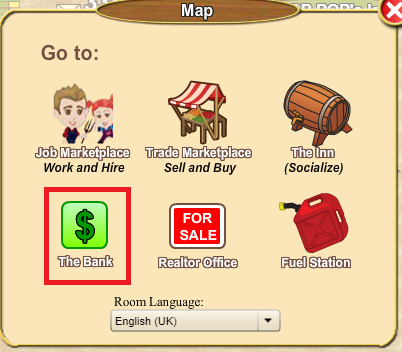 By clicking on the "Map" button which is on the bottom right of your screen, then select the "The Bank" in the menu that appears. Just like the 'buy cash' tab above your farm, the bank is the place to go to purchase farmcash or coins. Last edited by Tiger Laybourne; Oct 31 2018 at 05:38 PM. 1. Select the 'buy cash' tab above your farm or visit the bank. 2. Choose the amount of farmcash you would like to purchase, select the box beside 'terms of service' and then click on the green 'BUY' square. 3. Choose the payment method that you prefer. 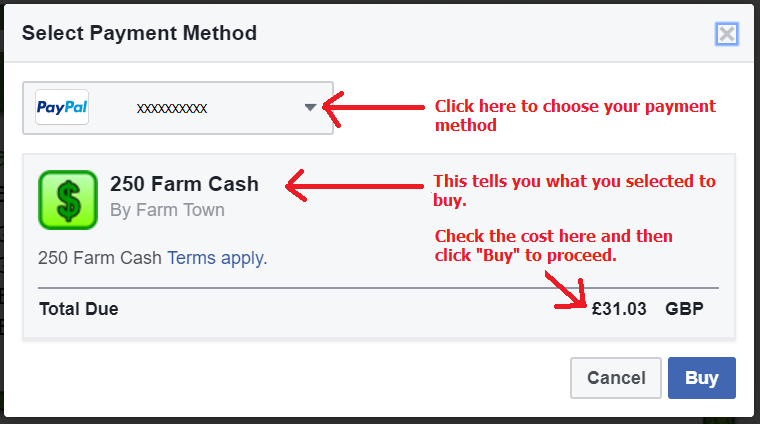 (Payment method must be registered with Facebook through your settings). Note: for purchases NOT using US dollars. You will not see what it will cost in your currency until you click the BUY button, then it will show you the cost in your currency in the Payment Method window as shown above. If you are not ready to buy yet you can cancel the transaction in that same window. Last edited by Tiger Laybourne; Feb 10 2019 at 12:16 PM. Although the game is free, certain luxury objects, buildings and tools are not available for purchase with coins. These objects which can not be purchased with coins are purchased with something called FarmCash also known as FC . These items are called "luxury" as they're viewed as bonuses for the game meaning they're not necessary to play, they just enhance the game in certain aspects. The majority of the items in the store can be purchased with the coins you earn while playing, perhaps from harvesting or plowing. Last edited by Tiger Laybourne; May 12 2018 at 01:44 PM. You start the game with 5FC. Each time you level-up in the game you will be awarded with 1FC for free. This means if you have never spent FarmCash and you are at level 33 of the game, you will have 38FC on the game. You can see your FC by looking at the counter which is right under your coins counter. This is an example of 5FC. Last edited by Tiger Laybourne; May 12 2018 at 01:38 PM. Last edited by Tiger Laybourne; May 12 2018 at 01:45 PM. This is a good question as there are both similarities and differences. The main difference is the way to earn coins and FC. Whenever you are working for someone on their farm, for example, harvesting for them, you will gain coins. You can earn FC for free when you level up. The FC, as mentioned, is used mainly for luxury items on the game. For example, decorations, buildings, or other "high-end" objects like the bigger tools can be purchased with FC. Last edited by Tiger Laybourne; May 12 2018 at 01:46 PM. This is normal, yes. All elements of the game such as animals, buildings, decorations and so-forth can be purchased with coins or FarmCash but if they are sold they will be repaid in coins - not FC. Last edited by Telegraphs; Apr 06 2010 at 06:33 AM. To get a refund, you must contact the Farmtown support team. To contact Support Click Here and fill in a ticket. Please note , depending on the workload of the support team, it can can anywhere from a few hours t several days for them to respond. Refunds are never dealt with here in the forum and it is up to support as to whether you are entitled to a refund. Last edited by marymarcel; Apr 19 2015 at 01:14 PM. Purchases of Farm Cash and any Farm Cash earned will have a green background. Those with a pink background are what you have spent in game. Last edited by Tiger Laybourne; Oct 25 2018 at 12:35 PM.